Consumption of trans fats is associated with an increased risk of non-communicable diseases, including cardiovascular disease. Trans fats, or partially hydrogenated vegetable oils, are commonly used in the food industry. Banning the use of trans fats in the preparation of foodstuffs is one of the most effective ways to prevent some of the world's biggest killer diseases, but many governments are not taking such action because they do not think these bans work, according to a University of Sydney study published in the Bulletin of the World Health Organization. Shauna Downs, lead author and researcher at the University's Menzies Centre for Health Policy at the University of Sydney, Australia said trans fats policies in Brazil, Canada, Costa Rica, Denmark, the Netherlands, the Republic of Korea and the United States of America (USA) over the last two decades had proven to be effective in removing trans fats from the food supply. She said the study's findings were particularly relevant for low- and middle-income countries where such measures have been identified as a "best-buy" policy for health - ie one that is expected to provide a high return on investment in terms of health gains. "We found for example, that a national ban in Denmark virtually eliminated trans fats from the food supply, while local bans in Canada and the USA were successful in removing trans fats from fried foods," Ms Downs said. "While some of the government policies we studied imposed voluntary self-regulation and others took mandatory measures, such as labelling, local and national bans on trans fats proved to be the most effective policies for removing trans fats. "Our findings show that these policies are not only feasible and achievable - they are also likely to improve public health." Trans fats - also known as trans fatty acids - are naturally found in dairy and meat products but also generated by industrial processes to produce hard fats from vegetable oils. The industrially produced trans fats are also known as partially hydrogenated vegetable oils. Consumption of trans fats is associated with an increased risk of non-communicable diseases, including cardiovascular disease, such as heart disease, as well as stroke and diabetes. 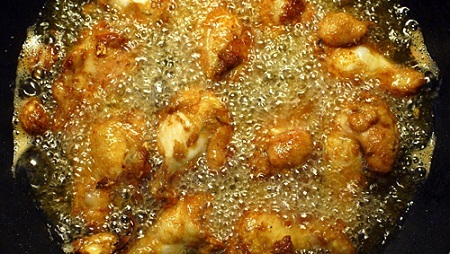 These partially hydrogenated vegetable oils are, however, favoured by the food industry and fast food outlets because they are cheap, have a long shelf life, are semisolid at room temperature, which makes them easier to use in baked products, and can withstand repeated heating. The World Health Organization (WHO) has called for the elimination of trans fats from the global food supply in response to the rise in the prevalence of non-communicable diseases and has identified it as a "best-buy" public health intervention for low- and middle-income countries. This proposed policy measure was advocated in the Political Declaration of the High-level Meeting of the UN General Assembly on the Prevention and Control of Non-communicable Diseases in September 2011. Dr Francesco Branca, department director for Nutrition for Health and Development at WHO, said the University study was important because it gave an overview of current policy approaches and compared their effectiveness. "It provides a rationale for strong regulations, such as national bans, and challenges voluntary approaches, given that their outcomes have been less satisfactory than mandatory measures," Dr Branca said. The issue of banning trans fats from the food supply is included in the WHO Action plan for the prevention and control of noncommunicable diseases, that will be discussed at the World Health Assembly next month, from 20 to 28 May 2013.